This fall, the owner and operator of North Dakota-based website NationalDayCalendar.com will be traveling to New York to mark National Dumpling Day. Why? Because the sponsor of that September 26 celebration, Asian foods distributor TMI Corp., is paying Marlo Anderson $4,000 to make the trip. The selection committee is made up of four Zoovio, Inc. employees. Amy LaVallie, a committee member, said the general rule is to pick days with broad appeal. It’s why “National Sean Connery Day” was rejected, she said, but Boston Market’s submission passed muster. “National Rotisserie Chicken Day, okay? People like chicken. Simple as that,” LaVallie said. 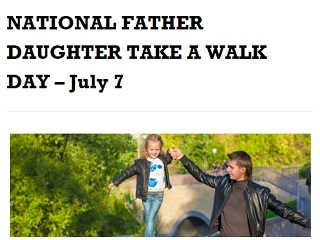 Per the illustration above, today is National Father Daughter Take a Walk Day, as well as National Strawberry Sundae Day and National Macaroni Day. There’s still time for some enterprising pair in NYC to hit all three of these. Start in Central Park and then order the necessary dishes at a nearby restaurant. By the way, all three of today’s annual celebrations are of the “unofficial” variety. E.g., they have been included in Anderson’s database without anyone paying a fee.